Four new commemorative coins issued by the Bank of Russia celebrate the upcoming Sochi 2014 Winter Olympic & Paralympic Games. Each represents a different sport of the games to include Biathlon, Alpine Skiing, Figure Skating, and Hockey. 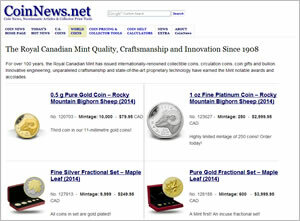 The Royal Canadian Mint is able to offer a small selection of the commemorative coins as an official Sochi 2014 Winter Olympic & Paralympic Games product partner. The RCM is able to sell 3,000 per design. Each Russian coin has a 35,000 worldwide mintage. Next year’s 2014 Winter Olympics will be held from February 7 to February 23 in Sochi, Russia. The 2014 Paralympic Winter Games follow on March 7 to March 16, 2014. All four commemorative coins feature reverse designs by artist. A.A. Brynza. Each depicts an athlete competing in their sport along with the year 2014 inscribed and the Olympic logo. To the bottom is a colored image of a piece of vegetation from the Sochi region. The Alpine Skiing silver coin depicts a magnolia, popular for decorating the region’s cities. The Biathlon silver coin offers a sprig from the Pitsunda pine while the Figure Skating silver coin showcases a Voronov’s Snowdrop, named for Russian botanist Y.N Voronov. Finally, the Hockey silver coin has a colored leaf group from a Cork Oak, an evergreen tree of the region. A relief image of the State Coat of Arms of the Russian Federation appears on each obverse, as designed by E.V. Kramskaia. Inscriptions include "THE RUSSIAN FEDERATION," the coin’s denomination of "THREE ROUBLES" and the year of issue "2014." The trademark of the Saint Petersburg Mint and the fine precious metal content are also shown. 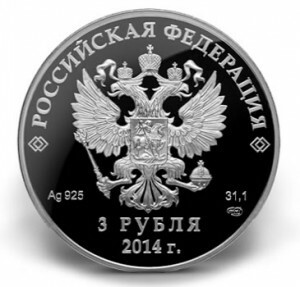 Each coin is from sterling silver (92.5% silver, 7.5% copper) and features a legal tender face value of 3 Roubles. The Sochi 2014 Winter Olympic Commemorative Coins ship in a Sochi.ru branded black wooden clamshell protected by a Sochi.ru branded white sleeve. A serialized certificate is also included with each coin. 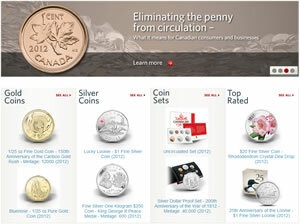 Current pricing through the Royal Canadian Mint is CAD $149.95 per coin. The strikes are only available to buy in Canada and are found here.